Organize and maintain data processes to meet your ongoing information lifecycle needs. Build a trusted Analytics foundation to drive better agility, insights and compliance. Quickly create, deploy and manage high-quality self-learning behavioural models to extract hidden value from enterprise data securely, in place and in real time. Host your data on public, private or hybrid cloud, using any of the following models: SaaS (Software as a Service), PaaS (Platform as a Service) or IaaS (Infrastructure as a Service). Extract, transform and integrate your data across multiple sources. Organize and maintain data processes to meet your ongoing information lifecycle needs and build a trusted Analytics foundation to drive better agility, insights and compliance. Empower your analysts, data scientists and business users with the tools they need to understand and analyze data, visualize information, predict business outcomes and automate using machine learning. Drive better performance with better intelligence. 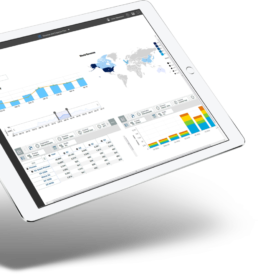 Gather, analyze and deliver trusted information in highly visualized dashboards and reports across all levels of your organization. Provide key decision-makers better insights into their business performance, allowing them to drive better business decisions and improve business performance. Meet your digital transformation needs with mapping and spatial analytics software solutions that deliver location intelligences. Available for organizations of all sizes. Continuously measure business performance against your strategy and objectives in order to identify areas of improvement. Act on those insights, to meet all your business goals. Predict with confidence what will happen next so you can make smarter decisions for your organization. Empower your data scientists with leading solutions in the predictive space. Make better decisions by solving complex optimization problems involving trade-offs between business goals and constraints. Quickly create, deploy and manage high-quality self-learning models. Securely extract hidden value from enterprise data, in place and in real time. Artificial Intelligence and Machine Learning offer value to companies trying to leverage big data and helps them better understand subtle changes in behavior, preferences, or customer satisfaction. Business leaders are beginning to appreciate that many things happen within their organizations and industries that can’t be understood through a query. It isn’t the questions that you know; it’s the hidden patterns and anomalies buried in the data that can help or hurt you. Utilize powerful systems that learn and train to be able to produce more precise models and outputs based on your specific data. The advantage of machine learning is that it is possible to leverage algorithms and models to predict outcomes. The trick is to ensure that the data scientists doing the work are using the right algorithms, ingesting the most appropriate data (that is accurate and clean), and using the best performing models. If all these elements come together, it’s possible to continuously train the model and learn from outcomes by learning from the data. The automation of this process (of modelling, training the model, and testing) leads to accurate predictions that support business evolution. Get set up with the cloud solution that best fits your organization - whether it’s a public, private or a hybrid cloud. We will also help you to determine the best cloud model for your needs, based on the workloads you want to keep in-house, versus the workloads you want others to manage for you. Potential cloud models include: SaaS (Software as a Service), PaaS (Platform as a Service) and IaaS (Infrastructure as a Service).